I’ve got another review for you motherfudgers. Thanks to my pal, CandyMaster, I was introduced to the hilarious creations from the Thug Kitchen cookbook: Eat Like You Give a F*ck. Some background: Thug Kitchen started as a blog (via tumblr) and expanded into a damn good cookbook. It’s mostly known for the plentiful amount of swear words in each recipe—as is evident by the title—but it’s overt theme is a bit more surprising. EAT MORE PLANTS! Yup, Thug Kitchen is vegan. If a startlingly strong voice just popped into your head, shouting NOOOOOOOOOOOO I LOVE CHEESE!! I can’t go on without my smoked Gouda!! then you’re not alone. I’m cheese’s #1 fan—I have been known to carry cheese wheels on my head—but some days it’s nice to put down the cheese knife (or wheel) and focus on some motherflipping plants for once. OFFICIAL MESSY COOKER REVIEW BELOW. Thug Kitchen cuts the BS and tells it to you straight. I respect that. It doesn’t hurt that their recipes are well rounded and challenge conventional dinner dishes either. I decided to tackle the Coconut-Lime Rice with Red Beans and Mango recipe. To my disappointment, I ended up with a bland meal and a bad attitude. To be real though, I can’t cut a mango to save my life and I didn’t use the freshest ingredients. I also may have used adzuki red beans from Fire Rooster’s Sweet Red Bean Buns, which may not have been the wisest (clearly, it isn’t my year). While I didn’t have the best luck, I think this recipe is still worth a shot. How can creamy coconut, zesty lime, hearty red beans, and tangy mango be bad?? Difficulty: cutting mangoes is the bane of my existence. Other than that, it was cool. Rice to meet you. Rinse the rice under cool water. Throw it in a pot. That’s it. Heat up the oil over medium heat in a large soup pot. Add the shallots or onions and cook until they begin to brown (~3 minutes). Add the ginger and cook for 30 seconds until it smells yummy. Keep adding stuff. I didn’t say you could stop. Add the rice and keep stirring until the rice starts to smell toasty (~2 minutes). Add the coconut milk, broth, salt, and cayenne pepper and bring to a simmer. Give the pot a quick stir, cover it, and let it be until the nearly all the liquid is absorbed (~ 40 minutes). *Note: if your rice isn’t done by the time 40 minutes hits, just add some more broth and let that shiznaz cook longer. So not good looking…but just you wait. Mango madness. While your rice is cooking, chop up the mango into bite-size pieces (and try not to drive yourself crazy). *Note: I am hopeless with mangoes. Here’s a video to help you cut that freakin’ fruit. I fold! When the rice is tender, fold in the beans, lime juice, and freakin’ pieces of mango. Let this cook together for 5 minutes or so, or until the mangoes are warm and gooey. Not-so-optional ending. When serving this feast, add cilantro on top. It makes a world of difference. (I failed to add cilantro and suffered dearly). Hey, remember when I said to add cilantro? In case you totally ignored that last step, add cilantro. Come on, dude. Here’s a neat trick. Put all of your cooking utensils in the empty coconut milk can. This will save you from cleaning your counters! There’s an easy way to cut a mango, apparently. Check it out. 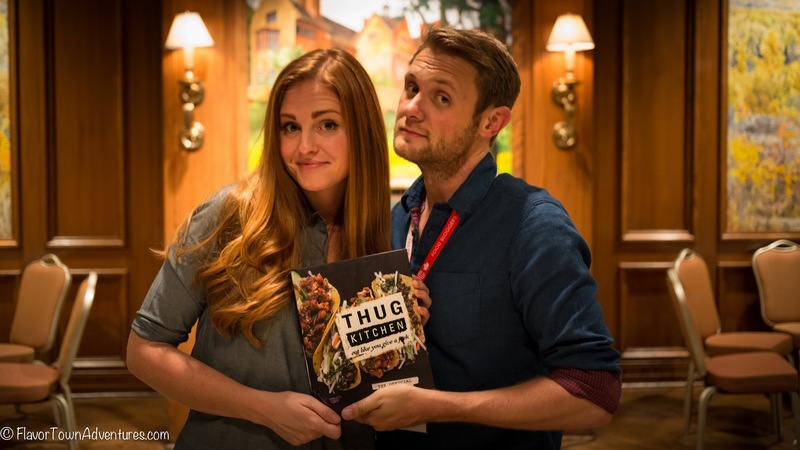 The authors of Thug Kitchen look nice, actually. Clickers. 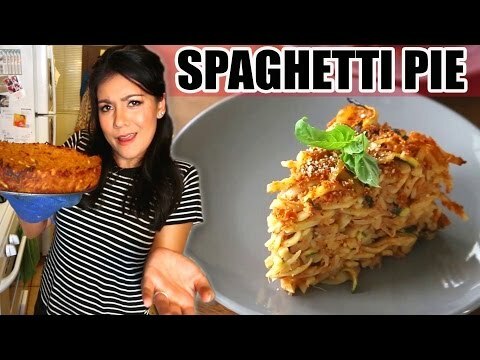 And here’s a weird picture of spaghetti pie. CLICKO.